From the top down, Shadow Libraries explores the institutions that shape the provision of [learning] materials, from the formal sector of universities and publishers to the broadly informal ones organized by faculty, copy shops, student unions, and students themselves. It looks at the history of policy battles over access to education in the post–World War II era and at the narrower versions that have played out in relation to research and textbooks, from library policies to book subsidies to, more recently, the several “open” publication models that have emerged in the higher education sector. From the bottom up, Shadow Libraries explores how, simply, students get the materials they need. It maps the ubiquitous practice of photocopying and what are—in many cases—the more marginal ones of buying books, visiting libraries, and downloading from unauthorized sources. 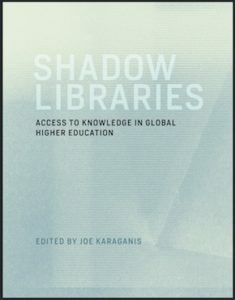 It looks at the informal networks that emerge in many contexts to share materials, from face-to-face student networks to Facebook groups, and at the processes that lead to the consolidation of some of those efforts into more organized archives that circulate offline and sometimes online—the shadow libraries of our title….. Universities play complicated roles in these conflicts, shaped by the fact that few make adequate provision of materials to their students. Regardless of copyright law, administrative preferences, or official positions, this reality usually dictates policies of toleration or accommodation of student practices—in some cases turning a blind eye to the copying ecosystem and in other cases moving to formally or semiformally incorporate it. This tolerance also reflects the proliferation of copying and communication technologies throughout the student and faculty population, which makes the copyright management function traditionally centralized in libraries largely obsolete…..
At one level, these skirmishes testify to the conservatism of universities. Few have followed the Brazilian example of cutting through the knot of narrow or obsolete copyright exceptions. Few have accepted publisher proposals to adopt more extensive surveillance and control of students and faculty—and, to the best of our knowledge, none to any significant effect. Few have moved decisively toward open models for the range of academic and teaching publications in use—though some schools, systems, and national research funders have begun to do so for research articles. In practice, the informal copying ecosystem operates as a safety valve for these conversations, denying publishers the more complete markets they want but also forestalling a sharper crisis of access that might lead to a break with existing publishing and policy paradigms. The copying ecosystem compensates, imperfectly but also cheaply, for the weaknesses of the commercial and library models of provision. Where this ecosystem is not internalized by the university, it is externalized by the students. I plan to excerpt some of the chapters in the next few days.